Another example of the ‘only democracy in the Middle East’. 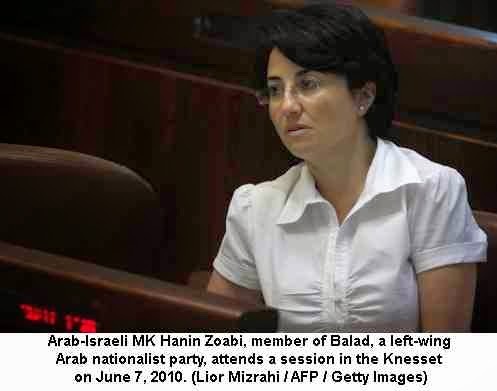 Haneen Zoabi, an articulate, forthright Palestinian member of the Knesset has been villified, suspended from the Knesset, barred from running (until the High Court overturned it) and now physically attacked during the election campaign by a range of Zionist parties. The reactions of the Police and the authorities to this concerted attack? Nothing. Far-right activists storm stage at Ramat Gan college event in which Zoabi, several other female MKs took part. Right-wing activists disrupted a political convention on Tuesday and attacked several female MKs, prompting security guards to evacuate the politicians. Participants at the event on women's issues at the College for Law and Business in Ramat Gan included MKs Haneen Zoabi (Joint List), Shuli Moalem (Habayit Hayehudi), Michal Biran (Zionist Union), Karin Elharar (Yesh Atid), Anat Berko (Likud) and Gabi Lasky (Meretz). Witnesses said supporters of right-wing extremist Baruch Marzel stormed the stage and poured a drink on Zoabi. The Joint List's spokeswoman, Emily Moatti, was also assaulted, and was taken to Tel Aviv's Ichilov Hospital. "The security guards tried to whisk us, especially Zoabi, out of there," said MK Biran, "and I was hit with an elbow to the gut." Biran added that people from both sides of the political divided riled things up. "Lieberman's people [from the Yisrael Beiteinu party] started it, but Marzel's people kept on going and Zoabi's supporters didn’t let things pass." During the course of the event, activists associated with the Habayit Hayehudi party, with Yisrael Beiteinu and Yachad, also yelled at Zoabi, preventing the audience to hear her remarks. Several activists then approached the stage and one poured the drink on her. 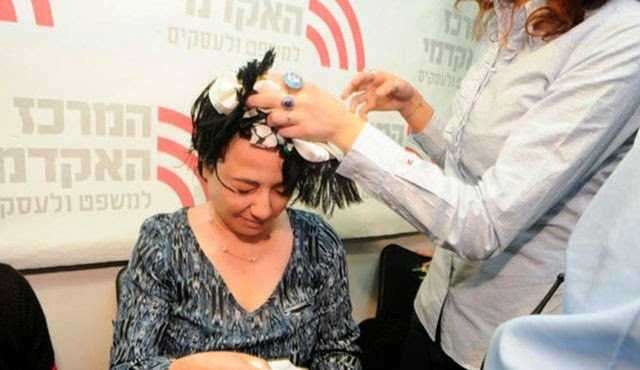 For her part, however, Habayit Hayehudi MK Shuli Mualem denied taking part in the brawl, and denied that she had assaulted an Arab woman at the event. "A female student or a Zoabi supporter, stood on a table and unfurled a Palestinian flag," she said. "I called on her to stop and take it down, because there is no place to fly a Palestinian flag in the State of Israel. They tried to take the flag from her. At that stage, I left the hall." Biran said that when the first question was posed to Zoabi, Yisrael Beiteinu activists began singing the Israeli national anthem to silence her. "In my opinion, that shows disrespect for the anthem, singing it to silence someone else," she said. "Then Anat Berko from Likud got up to calm things down, but at some point, she said: 'I don't agree with Miss Marmara either, and that didn't help calm things too much." 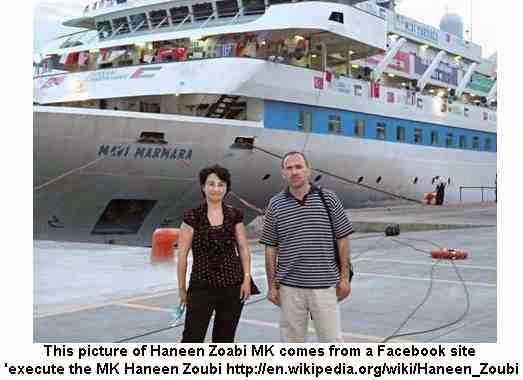 The reference was to Zoabi's presence on the Turkish ship, the Mavi Marmara, which was part of a flotilla that attempted to run the Israeli naval blockade of the Gaza Strip in 2010. Biran called the incident the low point of the campaign in the run-up to Knesset elections of March 17. Before the event, Marzel – who is running on Eli Yishai's Yachad ticket – posted a call on Facebook to "protest the disgrace." "When I am in the Knesset," he wrote, "I will do everything to wipe the smile off Zoabi's face." After the incident Marzel posted an additional comment in which he said: "We promised – and kept our promise!" The post was later deleted. The party then issued a statement that said in part: "The Yachad movement condemns and opposes any incident involving the use of violence. It also directs its members and supporters accordingly. 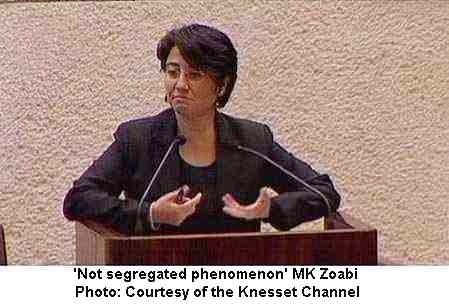 In addition, however, it is difficult to ignore Zoabi's provocations and her inciting conduct." The statement sarcastically added: "It's difficult to understand what she was looking for at the Ramat Gan conference when her potential supporters are in Gaza." Last month, the High Court of Justice overturned the decision to disqualify both Zoabi and Marzel from running in Israel's election on March 17. Aiman Odeh, the chairman of the Joint List, which includes Zoabi's Balad party, condemned the attacks on the women MKs, adding: "The wave of racism, exclusion and violence that has characterized the term of the current government continues in the current election campaign. It's sad to see that even at academic institutions, there is no long the possibility of conducting open discourse and presenting a range of views."